ZEUS DODONAIOS was the god of the celebrated oracle at Dodona--reputedly the oldest of its kind in Greece. It was located in the northern Greek region of Epeiros. The oracles were interpreted by bare-footed priests named Selloi from the rustling leaves of the holy oak trees. Later three elderly priestesses named Peleiades ("Doves") were appointed as the voice of the oracle. "Sokrates : They used to say, my friend, that the words of the oak in the holy place of Zeus at Dodona were the first prophetic utterances. The people of that time, not being so wise as you young folks, were content in their simplicity to hear an oak or a rock, provided only it spoke the truth." "As for the Pelasgoi, almost all agree, that some ancient tribe of that name spread throughout the whole of Greece . . . 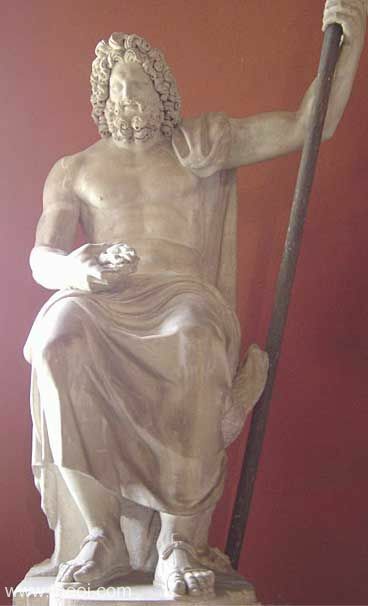 The Zeus Dodonaios (of Dodona) is by the poet [Homer] himself named Pelasgikos (the Pelasgian) : ‘O Lord Zeus, Dodonaios, Pelasgikos.’"
"The Molossoi [a tribe of Epeiros] grew to still greater power . . . partly because of the fact that the oracle at Dodona was in their country, an oracle both ancient and renowned." "All Epeiros and the Illyrian country were rugged and full of mountains . . . at the present time desolation prevails in most parts, while the parts that are still inhabited survive only in villages and in ruins. And even the oracle at Dodona, like the rest, is virtually extinct. It is thought, Apollodoros says, that the land was so called from the marshes around the temple . . . And as for the myths that are told about the oak-tree and the doves, and any other myths of the kind, although they, like those told about Delphoi, are in part more appropriate to poetry, yet they also in part properly belong to the present geographical description. At the outset, it is true, those who uttered the prophecies were men (this too perhaps the poet indicates, for he calls them hypophetai, and the prophets might be ranked among these), but later on three old women were designated as prophets, after Dione also had been designated as temple-associate of Zeus. Suidas, however, in his desire to gratify the Thessalians with mythical stories, says that the temple was transferred from Thessalia, from the part of Pelasgia which is about Skotoussa (and Skotoussa does belong to the territory called Thessalia Pelasgiotis), and also that most of the women whose descendants are the prophetesses of today went along at the same time; and it is from this fact that Zeus was also called Pelasgios." "Kineas says that there was a city in Thessalia, and that an oak-tree and the oracle of Zeus were transferred from there to Epeiros." "In earlier times the oracle [of Dodona] was in the neighborhood of Skotoussa, a city of Pelasgiotis; but when the tree was set on fire by certain people the oracle was transferred in accordance with an oracle which Apollon gave out at Dodona. However, he gave out the oracle, not through words, but through certain symbols, as was the case at the oracle of Zeus Ammon in Libya. Perhaps there was something exceptional about the flight of the three pigeons from which the priestesses were wont to make observations and to prophesy. It is further said that in the language of the Molossians and the Thesprotians old women are called peliai and old men pelioi. And perhaps the much talked of Peleiades were not birds, but three old women who busied themselves about the temple." "According to the Geographer, a sacred oak tree is revered in Dodona, because it was thought to be the earliest plant created and the first to supply men with food. And the same writer also says in reference to the oracular doves there, as they are called, that the doves are observed for the purposes of augury, just as there were some seers who divined from ravens." "Among the Thesprotians and the Molossians old women are called peliai and old men pelioi, as is also the case among the Makedonians; at any rate, those people call their dignitaries peligones . . . And this, it is said, is the origin of the myth about the pigeons in the Dodonaian oak-tree." "The proverbial phrase, ‘the copper vessel in Dodona,’ originated thus : In the temple was a copper vessel with a statue of a man situated above it and holding a copper scourge, dedicated by the Korkyraians; the scourge was three-fold and wrought in chain fashion, with bones strung from it; and these bones, striking the copper vessel continuously when they were swung by the winds, would produce tones so long that anyone who measured the time from the beginning of the tone to the end could count to four hundred. Whence, also, the origin of the proverbial term, ‘the scourge of the Korkyraians.’"
"Skotoussa [in Perrhaibia, Thessalia] I have already mentioned in my account of Dodona and of the oracle in Thessaly." "[The historical general] Pyrrhos the Molossian . . . [after a war with the Makedonians] dedicated the bucklers of the Makedonians to Zeus Dodonaios (of Dodona). They too have an inscription :--‘These once ravaged golden Asia, and brought slavery upon the Greeks. Now ownerless they lie by the pillars of the temple of Zeus, spoils of boastful Makedonia.’"
"Among the sights of Thesprotia are a sanctuary of Zeus at Dodona and an oak sacred to the god." "The keel which had been fitted beneath the ship [Argo] was wrought of an ancient tree, the tree which Zeus used for his oracular utterances at Dodona." "[Ostensibly a description of a painting at Neapolis (Naples) :] Dodona. Here is the golden dove still on the oak, wise in her sayings; here are oracles which are utterances of Zeus; here lies the axe abandoned by the tree-cutter Hellos, from whom are descended the Helloi of Dodona; and fillets are attached to the oak, for like the Pythian tripod it utters oracles. One comes to ask it a question and another to sacrifice, while yonder band from Thebes stands about the oak, claiming as their own the wisdom of the tree; and I think the golden bird has been caught there by decoy. The interpreters of Zeus, whom Homer knew as ‘men with unwashen feet that couch on the ground’ [Iliad 16.235], are a folk that live from hand to mouth and have as yet acquired no substance, and they assert that they will never do so, since they think they enjoy the favour of Zeus because they are content with a picked-up livelihood. For these are the priests; and one is charged with hanging the garlands, one with uttering the prayers, a third must attend to the sacrificial cakes, and another to the barley-grains and the basket, another makes a sacrifice, and another will permit no one else to flay the victim. And here are Dodonaian priestesses of stiff and solemn appearance, who seem to breathe out the odour of incense and libations. The very place, my boy, is painted as fragrant with incense and replete with the divine voice; and in it honour is paid to a bronze Ekho, whom I think you see placing her hand upon her lips, since a bronze vessel has been dedicated to Zeus at Dodona, that resounds most of the day and is not silent till someone takes hold of it." "The Molossi in whose territory is the temple of Jove [Zeus] of Dodona, famous for its oracle." "Propheteia (the prophetic gift) : . . . the priestesses Pythia [of Apollo at Delphoi] and Dodona [of Zeus at Dodona] who divine through trees." Other references: Iliad 16.233, Herodotus 2.55. "Pandosia [a town in Brettion, Italia] . . . near which Alexandros the Molossian was killed. He, too, was deceived by the oracle at Dodona, which bade him be on his guard against Akheron and Pandosia; for places which bore these names were pointed out to him in Thesprotia, but he came to his end here in Brettion. Now the fortress [of Pandosia in Brettion] has three summits, and the River Akheron flows past it. And there was another oracle that helped to deceive him : ‘Three-hilled Pandosia, much people shalt thou kill one day’; for he thought that the oracle clearly meant the destruction of the enemy, not of his own people." "Ephoros says that the Thrakians, after [historically] making a treaty with the Boiotians, attacked them by night when they, thinking that peace had been made, were encamping rather carelessly . . . and the Pelasgians, when the war was still going on, went to consult the oracle [of Dodona], as did also the Boiotians. Now Ephoros is unable, he says, to tell the oracular response that was given to the Pelasgians, but the prophetess replied to the Boiotians that they would prosper if they committed sacrilege; and the messengers who were sent to consult the oracle, suspecting that the prophetess responded thus out of favor to the Pelasgians, because of her kinship with them (indeed, the temple also was from the beginning Pelasgian), seized the woman and threw her upon a burning pile, for they considered that, whether she had acted falsely or had not, they were right in either case, since, if she uttered a false oracle, she had her punishment, whereas, if she did not act falsely, they had only obeyed the order of the oracle. Now those in charge of the temple, he says, did not approve of putting to death without trial--and that too in the temple--the men who did this, and therefore they brought them to trial, and summoned them before the priestesses, who were also the prophetesses, being the two survivors of the three; but when the Boiotians said that it was nowhere lawful for women to act as judges, they chose an equal number of men in addition to the women. Now the men, he says, voted for acquittal, but the women for conviction, and since the votes cast were equal, those for acquittal prevailed; and in consequence of this prophecies are uttered at Dodona by men to Boiotians only; the prophetesses, however, explain the oracle to mean that the god ordered the Boiotians to steal the tripods and take one of them to Dodona every year; and they actually do this, for they always take down one of the dedicated tripods by night and cover it up with garments, and secretly, as it were, carry it to Dodona." "The god at Dodona too manifestly advises us to respect suppliants. For about the time of Apheidas the Athenians received from Zeus of Dodona the following verses :--‘Consider the Areopagos, and the smoking altars of the Eumenides, where the Lakedaimonians are to be thy suppliants, when hard-pressed in war. Kill them not with the sword, and wrong not suppliants. For suppliants are sacred and holy.’"